Gathering a huge amount of grains can seem very daunting. But it is even more overwhelming when you don't live in the Intermountain West, where grains packaged for home-storage are readily available. I didn't realize quite the challenge this presented until we moved to New York. All of a sudden the availability of simple things like buckets presented a huge challenge. So, today I want to talk about options that are available for those of you who don't have home-storage supplies sold on every corner. You might be surprised about the resources actually available to you. Warehouse/Grocery Stores - Once you start looking for home storage supplies, you might not have to look farther than your local grocery store or warehouse store. Costco, for example, sells large bags of rice, beans, and popcorn at most of their stores. Often these items come in sacks and will need to be repackaged. Even if bulk quantities aren't available, it is possible to acquire a decent amount of storage by just purchasing smaller packages at your local grocery store. Depending upon the cost per pound, though, it may be worth it to order your home-storage, already packed appropriately, online (see below). Home Storage Centers - There are LDS home storage centers all over the United States and Canada. Click here to find out the nearest location. If you live near one or travel nearby, these can be a wonderful resource. It might even be worth driving several hours to be able to utilize one of these centers and the very inexpensive products that they sell. You can also order grains, beans, as well as foil pouches and pouch sealers online through the LDS Catalog. LDS Congregations - Local congregations of The Church of Jesus Christ of Latter-Day Saints will sometimes put together group orders from large home-storage companies. If you aren't a member of The Church of Jesus Christ of Latter-Day Saints, check your phonebook for a local church -- or ask someone that you know is a member. I'm sure that these congregations would not hesitate to let you add some supplies to their orders. Local Bakeries/Packagers - Food-grade storage buckets (not recommended in humid climates) can also be found through neighborhood bakeries (once held frosting). Water barrels can be acquired from soda-packaging companies. Remember that it is essential that these containers be food-grade and completely clean so that your food supplies will store well long-term. Online - You can purchase grains and beans easily online. There are extra charges for shipping, of course. PreparedLDSFamily posted a great online price comparison on her blog this week. 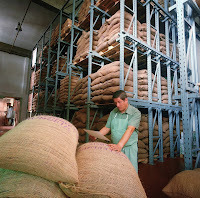 It shows typical prices per pound found at all of the major online suppliers. You'll find grains and beans on her list, along with many other products for home-storage. She doesn't account for shipping, though. For your information, I know that Walton Feed ships based on weight. They are often the source for many LDS congregation orders. Honeyville Grain charges $4.95 for shipping no matter how large the order, but their prices are higher to start with to account for weight. Emergency Essentials charges shipping by the item. Blue Chip Group also ships by weight. Shelf Reliance offers free shipping on any order over $200, though most of their prices are higher than any of the rest. The Church of Jesus Christ of Latter-Day Saints only offers limited products to be shipped. Shipping costs are already incorporated into that cost. I would recommend comparing price-per-pound as well as shipping prices before ordering from any of these companies. It is more difficult and expensive to acquire home-storage supplies outside of the Intermountain West, but it is doable. Watch your local stores, be aware of repackaging options, and check online. Through various combinations of these methods, our family was able to store grains and beans even though we were far from the best sources. Do you live outside of the Intermountain West? What "local" options have you found for purchasing home-storage supplies? I'm especially eager to hear from any readers outside of North America. If you are willing to share, it may help other readers around the world.